I'm building a new PC to replace my laptop, most of the components are finalised, I just need help choosing a GPU and a display. At my budget, I'm down to the 1070 and the 2060. For normal games, the 2060 comes ahead of the 1070, but I'm worried about the 6GB memory on the 2060. Is the 2GB extra memory worth going for the 1070 ? I could, in theory, get the RTX 2070, but that would require cutting down on storage options. Regarding the display, I want to get a 144Hz display, but I'm worried about how well the flight sims will go with it ? How will v-sync work with it ? I doubt P3D or X-Plane can do 72fps stable to keep up with the monitor. For the processor, I've decided to go with the 8086K. From what I can gather, it is generally better binned, and also runs cooler than the 9700K at similar clocks, and offers the option of hyperthreading. Regarding storage, I plan on getting a 1TB SSD, for the boot drive, and for the base sim. Sceneries and the like will be stored on a 4TB 7200RPM HDD. Also, for RAM, how much difference does the RAM frequency make ? Tough decision. Do what u can and go for the 2070. P3D v4 is GPU hungry. Regarding﻿﻿ the display, I want to get a 144Hz display, but I'm worried about how well the flight sims will go with it ? How﻿ will v-sync work with it ? 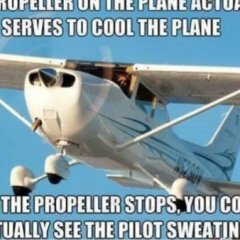 I doubt P3D or X-Plane can do 72fps stable to keep up with the monitor. Realistically plan on 30 FPS. A 144hz display that is 30hz capable would be awesome. Good rule of thumb is go for minimum 3000-3200mhz with a cl14-16 depending on price. Will hyperthreading benefit u in other apps? Most will have to disable for max overclock. 9600K? Use the money saved and put it towards a 2070. The 9600K will not reach 8086K speeds but it will still run P3D very well. From what I see on my system, P3D is CPU limited. I've never seen GPU use at more that 40%, but then again, my settings are geared towards my own laptop. I could get a 9600K and the 2070 at roughly the same price. I'll have to see how the 9600K reviews are and make a call. For RAM, I was planning on getting 2666MHz. Faster RAM frequency I understand, could you explain what CL timing is ? From what I read, RAM timings dont effect Intel systems as much. Is it different for P3D ? To put it simply CL is the memory response time. AMD cpu’s do benefit more from faster memory but it is still important for Intel systems. Go at least 3000mhz. 9600K is the best bang for the buck. Almost half the price of a 8086K while giving up very little in terms of performance in P3D. Just depends if that little extra bit of speed is worth the extra cost. But if I was going to spend upwards of $350 on a cpu it’s going to have eight cores. P3D will easily saturate a six core cpu in demanding situations. Eight cores will give you more headroom for scenery loading and background tasks. I’ll take a 9700K plugging away at 5.0ghz on eight cores over a 5.3ghz six core chip any day of the week. If u do go the 9700K route invest in good liquid cooling. Just for reference my 9700K at 5.1ghz runs mid 70’s under demanding situations. I agree with Matt's recommendation. A few months ago, I built a new system and chose RAM at 3200 MHz CL16 (CL15 or CL14 would have been better, but were too expensive at the time). For the CPU, I looked at the 8086K, 9900K, 9600K and 9700K. I discarded the 8086 and 9900 because of the price, discarded the 9600K because it has only 6 cores, and chose the 9700K for its 8 cores. I don't need Hyper Threading since the only demanding software I use is P3Dv4. I overclocked the 9700K to 5.0 GHZ (all cores) and even if air cooled (Noctua DH-U14S) it stays between 65C and 75C under load. P3D makes full use of all 8 cores, without saturating it. I'm concerned about the cooling on the 9th generation Intel chips, as reports are that the soldered IHS is not really that good, and delidding them is more difficult than delidding an 8th gen chip. Are you running a delidded 9700K or a standard one ? Are you running a delidded 9700K or a standard one ? Mine is standard. Buy a good cooler and don’t worry about it. In my opinion you should skip the 8086k and get either a 8600k or 9600k (they’re identical in performance clock to clock) and overclock to 5ghz (should be easy). This will get you pretty much the same performance as the 8086k. From my experience, HT has no benefits in P3dv4. For GPU, skip the Rtx 2060, it won’t hold up well in the near future. If your budget allows gets the RTX 2070 (optimal for 1440p).